Everywhere you look, read and listen seems to be full of information about the First World War. My grandfather fought in France, but he never talked much about it. All I knew was that it left him with a hatred of mud, a pair of army issued jodhpurs and lungs destroyed by mustard gas. But it was 100 years ago. Does it even matter now? I was wondering about this and decided to ask Sally Murphy whose latest book 1915 has just been released. Thank you Sally for your thoughtful, fascinating piece. The idiom ‘don’t mention the war’ or ‘don’t talk about the war’ warns people not to talk about a conflict when those present might support opposing sides. If we don’t talk about it, we avoid stirring up bad feeling. But for many returned soldiers, from World War 1 and other conflicts, talking about what happened there was also problematic, because it reminded them of truly traumatic events. As a result, though facts such as dates and locations and even casualty counts have been passed down, in many cases personal stories were lost. This is one reason I choose to write historical fiction. In 1915 I tell the story of Stanley, a young teacher who volunteers to fight in Gallipoli, as well as the stories of his fellow soldiers, his sister Elizabeth back home in Australia, and others. These are fictional characters, but their stories are based on real events. I hope to give readers a personal insight into what it must have been like to be part of the horror which was World War 1. Why does it matter, a hundred years down the track? Because when we understand our past, we also understand our present and, hopefully, work to make a better future. World War 1 was termed ‘the war to end all wars’. Sadly, of course, it wasn’t. But if we increase our understanding of what went on, maybe we can increase our awareness that there must be a better way. Of course, there are other reasons to write historical fiction. One of these is that understanding our past makes us understand who we are as a country (and as a world) today. 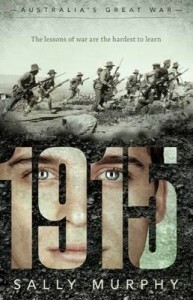 In the case of 1915, the book is set right at the birth of the ANZAC legend. Few Australians don’t know the word ANZAC, but sadly some don’t know or understand who the first ANZACs were. Another reason is simply that history is interesting. Not just the events themselves, but the way things were done in the past, and the characters of the time, all unite to add interest. In 1915 we see, for example, the role of letters, a mode of communication which is very different to today’s emails and text messages. Lastly, historical fiction is, like all fiction, populated by characters. Whether they live in 1915 or 2015 or 2115, when we connect with characters we laugh, we cry, we want to know them. I hope that readers want to get to know Stanley and his friends – and perhaps, afterwards, to talk about the war. Thanks for this great post, Sally and Alison. Being a writer of historical fiction in this era, I loved your explanation, Sally, behind the value of learning what happened in the past and how it might influence the present. Though, at the time, not talking about the war was deemed the best way to recovery, and many poor diggers had good reason to forget the horrors, sadly, I think too many coming after them forgot, or didn’t want to know. Books like 1915 are so important to both honour the Anzacs and their sacrifice (not war), and remind us why we should not be allowing it to happen again.